See the Conference Day 1 Recap post here! 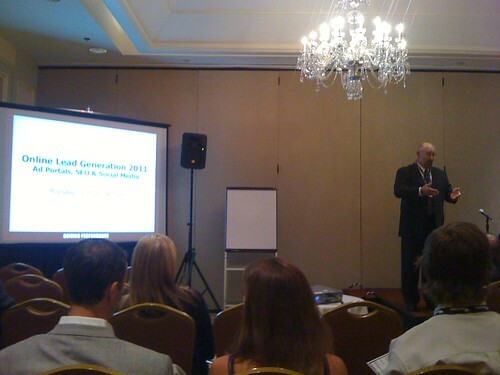 In the second set of concurrent sessions, I joined the “Online Lead Generation 2011” presentation by Gary Gardner. A number of topics were discussed in an open format that encouraged audience participation, exploring the impact of the Internet on franchising over the past 10 years, and forecasting what’s to come in the future. Although the topics covered were fairly high-level and not too advanced, it was a great discussion. Wrapping up the day were the business solutions roundtables. Along with Andy Gorman (Vice President, Localeze), I facilitated the roundtable on “Building a Strong Local and Online Presence”. Andy and I fielded questions from folks on developing a content strategy, getting started in social media, increasing visibility in search engines, and how to increase local lead generation online. See the Conference Day 3 Recap post here!